It has been busy at work and busy at home, and when the days are short and the list of things to do is long, the blog suffers. But, I have a quilt to share that I finished last week but am just now posting. I finished my pattern for the Batik Colorwash Quilt kit. This is the demo, the pattern is ready, and I have lots of kits ready too. Now I just need the website. But that will be coming soon. 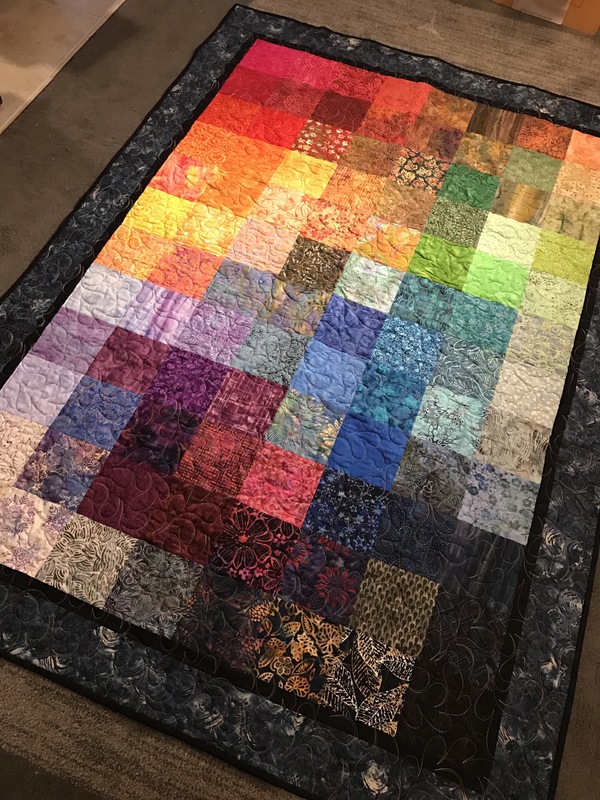 I do love this quilt – it is beautiful and impactful and goes together quickly. I should have named it my Instant Gratification Quilt. 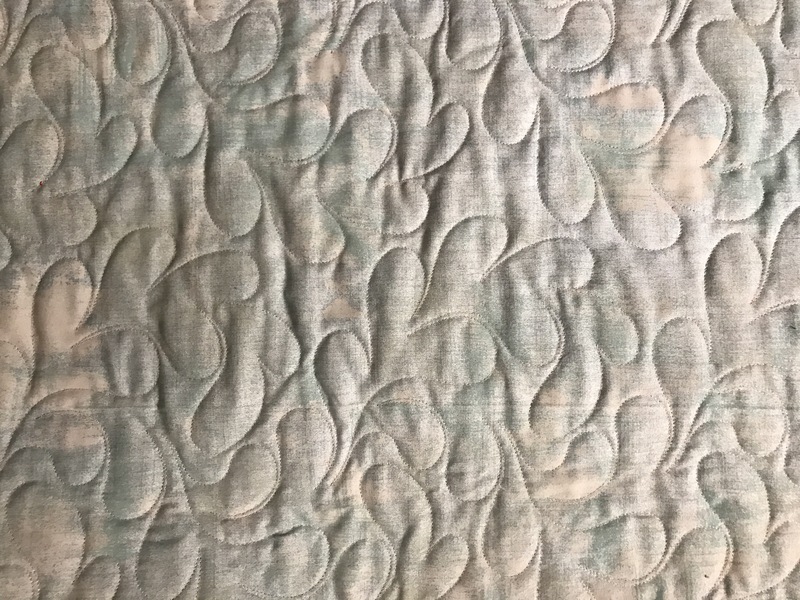 The quilting itself is Funky Feathers which came with my ProStitcher upgrade. I used a multicolor poly blend thread to get a little shine. Love it. You can see the quilting better on the back. I used a light teal Moda Grunge to keep the back quiet, but also to show the quilting. The quilt measures 54″ wide by 76″ high. It is perfect for a lap, to throw over a couch, or even to act as a statement piece on a wall. It should take 3-4 hours to piece as the squares are cut to size in the kit. This is definitely an easy beginner project. If you want a kit before I have them posted, let me know. 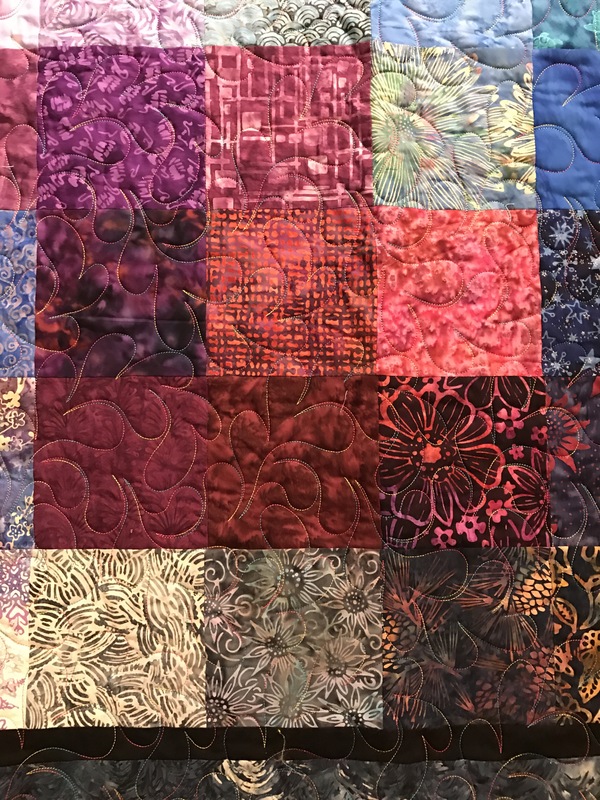 This is amazing – the quilting is gorgeous and so even and the batiks are so amazingly effective, even as simple squares. I think you may have given me the encouragement to go for something simple myself!